I was recently tasked with creating a web part for displaying a user’s Outlook calendar events using the new Microsoft Outlook API endpoints. This requires passing an authorization token in the header of any request in order to gain access to a user’s Outlook data. Before you flee at the prospect of dealing with SharePoint, let me assure you this guide has very little to do with SharePoint (I know very little about SharePoint and how it works). This article is a step-by-step guide of how I connected to the Outlook API. OAuth2 has several “flows” that handle different scenarios. 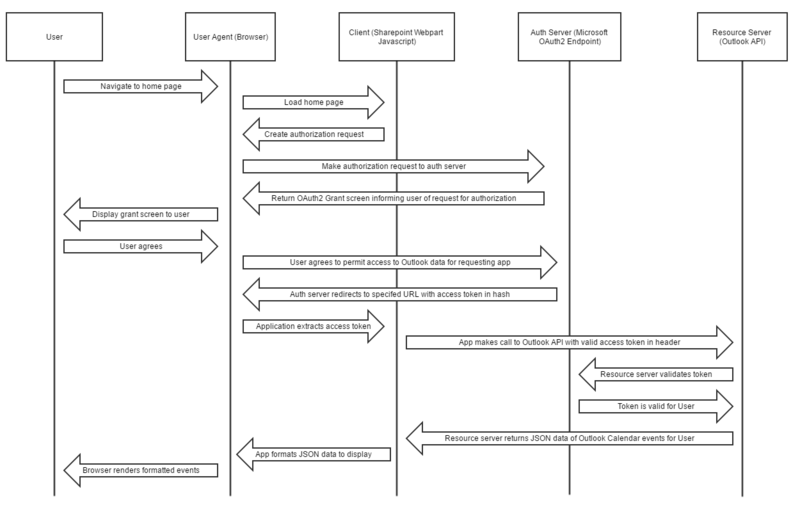 There’s the Authorization Code flow, Implicit Grant flow, Resource Owner Password flow and the Client Credentials flow. The latter two are only used in very specific situations, so I won’t go into those here. The most commonly used are the first two. Redirect URI — tells the authorization server where to send the token back to. This is where we’ll extract the token from the hash fragment. In our case, we’re simply redirecting back to our homepage, the same page from which we made the initial request. This is not a required parameter per the OAuth2 specification, but it’s commonly used. Scope — another optional parameter that tells the authorization server the scope of what we need to be able to do with our subsequent request. In our case, we’re using the https://outlook.office.com/Calendars.Read scope to tell the authorization server we’re only interested in being able to read a user’s Outlook calendar data. If this parameter is not specified, the authorization server should have a default scope it uses. State — a security-related parameter that can be added to the request to make it easier to verify the response is coming from the authorization server and not another source with ill intent. The idea is to create a string that would be very difficult to mimic (some suggestions I found were to use a hash of the session ID, or current date time, or both) and then send this with the request. The authorization server should then send back the exact same string when it returns the authorization token. If not, then the call was hijacked, and the response can’t be trusted. After making this call, the user will be presented with the standard Microsoft authorization page, where he or she will choose the account to authorize the Outlook API for and will be informed of the scope of the request (this is your typical “the application has requested permission to access your calendar” message). Then, the user will be redirected back to the homepage, with a few new parameters in the hash fragment. You’ll notice the state parameter is identical between the two URLs, which indicates the response is safe. At this point, we can choose to store this token in a cookie so the user won’t have to continue to grant access each time he or she navigates to the page. One of the ways the implicit flow differs from others is there are no refresh tokens granted, which allows the refreshing of access tokens without having to go through the authorization process again. This will return a response that, if successful, will contain JSON representing all of today’s events from the user’s Outlook calendar. 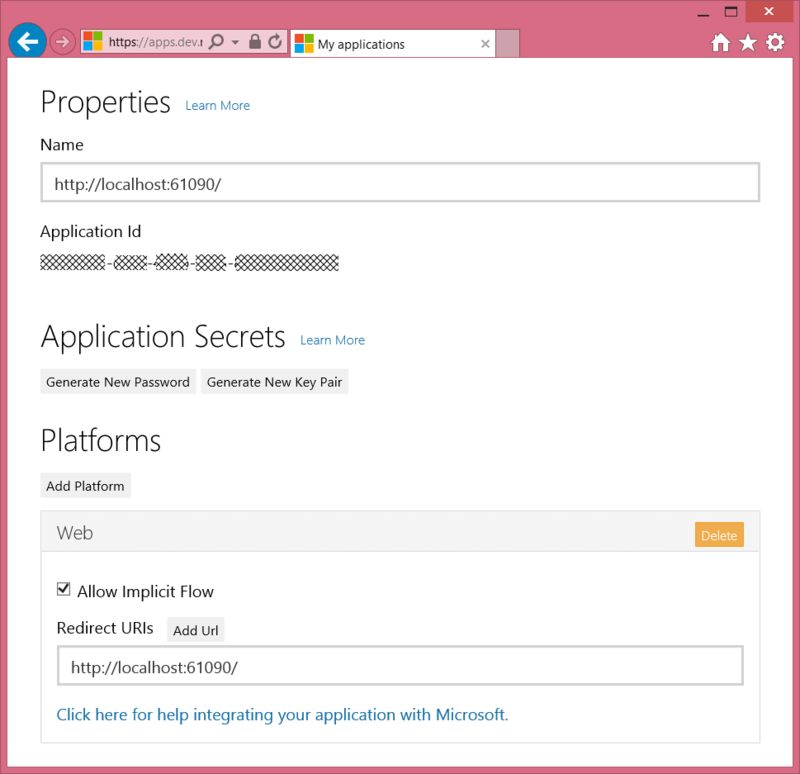 You can play around with the API at https://oauthplay.azurewebsites.net by logging in with any Microsoft account. If you need to make a call to an OAuth2 protected endpoint from client-side code, the implicit flow is the way to go. It’s pretty straightforward once you understand the parameters required in your request and how to extract what you need from the response. Once you obtain that authorization token, getting the data you need is as simple as adding an HTTP header and firing away. This article originally appeared on May 12, 2016.